Available artwork includes an Earth and a space ship, but other treatments, including other planets, can be created with the cost dependant on the complexity of the artwork. 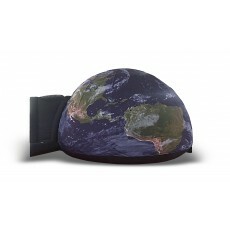 The Dome Cover is very light weight and is placed over the dome as it is inflated. The dome cover then stays in place until the dome itself is deflated. It cannot be viewed from inside, but a complementary projection is supplied as a fisheye or warped fisheye for you to use in your projection system, per- haps as visitors enter the dome and take their seats. The Dome Cover can also be customized or commercialized depending on your audience and the availability of photographs or original artwork. Note: Price assumes conversion from customer's custom design.